The sounds "Om", "Ah" and "Hum" are individual Sanskrit seed syllables. The first thing we notice is that consists of three words which corresponses to that of Body, Sound (or Speach) and Spirit (or Mind). 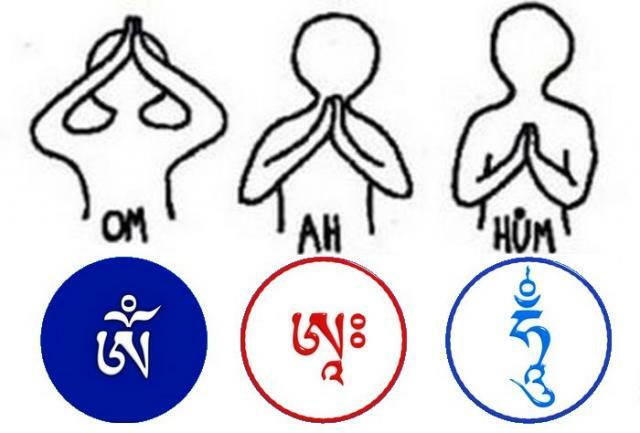 The perfect state of being of each of these three bodies is symbolized by the three words of "Om Ah Hum". The Body is not only the physical body of man but also the entire material dimension of the individual. The Sound is the life energy of the Body. The Spirit is the reason and that what is behind the reason. "Om" is the primal vibration out of which all things came forth and into which all things will be absorbed at the end of the cosmic cycle. Om is the first manifestation from Shiva-Shakti in the form of sound consciousness. At the same time Om is the quintessence of the universe. It is the highest expression of consciousness. "Om" is like the opening of our arms to embrace all that lives and exists. It brings peace, bliss, clarity, firmness, courage, stability and strength. "Om" descends from the Crown chakra to the heart chakra in order to be transformed into vibrant life. "Ah" is the symbol of the primal state of the spirit. It is the female aspect, the mother fully expressed in divine wisdom. It is also the unborn, a state of being that is without thought. It is the essential state of Emptiness. "Ah" is the expression of wonder and direct awareness. It is a point of stillness, of emptiness. Ah brings energy, openness, expansion and empowerment. "Hum" is the root vibration, the smallest, undividable unity of sound as reflection of the essential nature of Kundalini-Shakti. Hum is the descent from universality ("Om") into the human heart. "Hum" is the infinite in the finite, the eternal in the temporal. The long ’u’ sound in Hum expresses a downward movement to accentuate this descent. The ’h’ in "Hum" is the sound of the breath (prana) and ’m’ hints at a state beyond duality. "Hum" is brings expansiveness, infinity, essence and oneness into the human being.